Staring out the window you can’t help but notice the mature trees and what looks like a small, dried up creek. 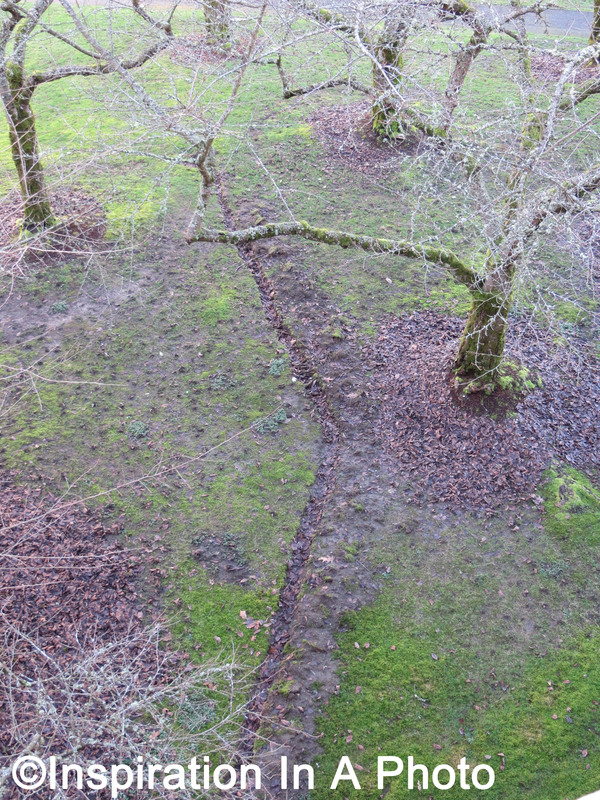 It reality, this meandering indentation is a trench for an underground pipe. After installation, the trench was never filled in. As a result, I’m left with a beautiful picture of a faux creek meandering through trees! A similar picture is a great way to bring the outdoors into any room. As I’ve said in previous posts, optical illusions can provide great photographs and fun stories. No matter where you are, you’re sure to find an optical illusion that will be the perfect addition to your space! 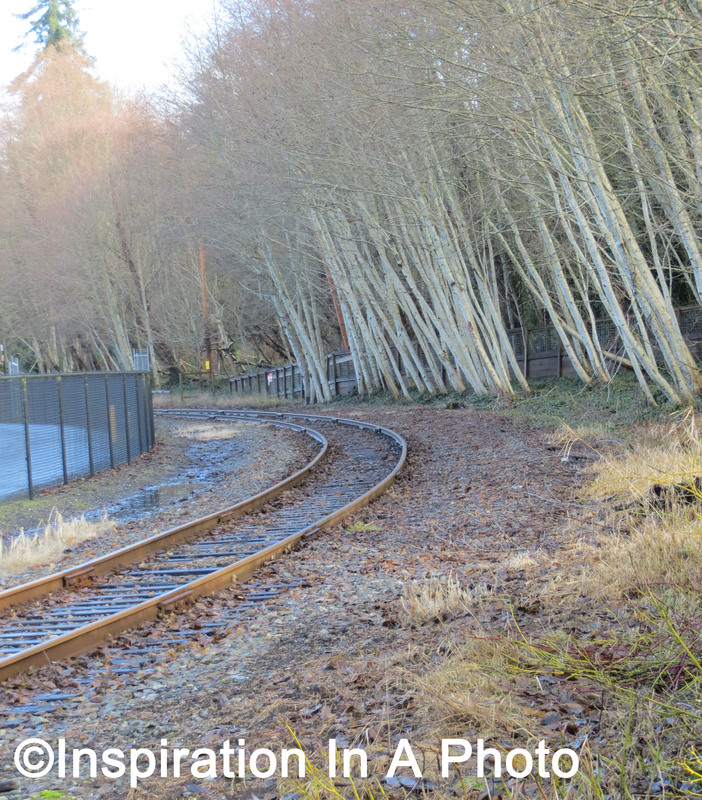 On one of my daily walks, I made my way down a hill and saw these railroad tracks curving around a bend. I like how the tracks are flanked on both sides by a fence, in addition to the trees that seem to lean inwards. Though you may not think so, there are so many possibilities with a photo like this! It would look great displayed in a living room or den, or could be the inspiration for a new decorating theme that incorporates earth tones mixed with metal and wood-based accessories. Taking photos of places near your home or work is a great way to find new ways to inspire yourself and decorate your space. Whether displaying your works of photography, or using them as a base for new decor, there’s a whole world out there waiting to inspire you! During this time of year we often ignore the trees that have lost their leaves. However, if you take the time to examine them, you’ll be surprised at what you can find. You can often see nests or, as seen above, a water view. The majority of the year, all I can see are leaves as I look out my office window. However, while I lost a bit of greenery, I’ve gained a (temporary) water view! Nature, like decorating, can bring unexpected surprises throughout the seasons. By looking at your space in a new perspective, you can easily find treasures that are right in front of you. One evening, my Mom called me over to the window to view the glowing clouds during a sunset. I love the various shades of orange, red, purple, and blue! The trees appear to frame the photo, creating a unique shot. If you have a favorite time of day when you think the sky looks its best, take a photo and display it prominently in your home. This will not only allow you to show off your photography skills, but you’ll also have a great addition to your wall. Displaying a photo on your wall is a great way to bring new life into an old space. No matter if it’s sunrise, sunset, or high noon, you’ll find the perfect time to photograph the perfect sky! 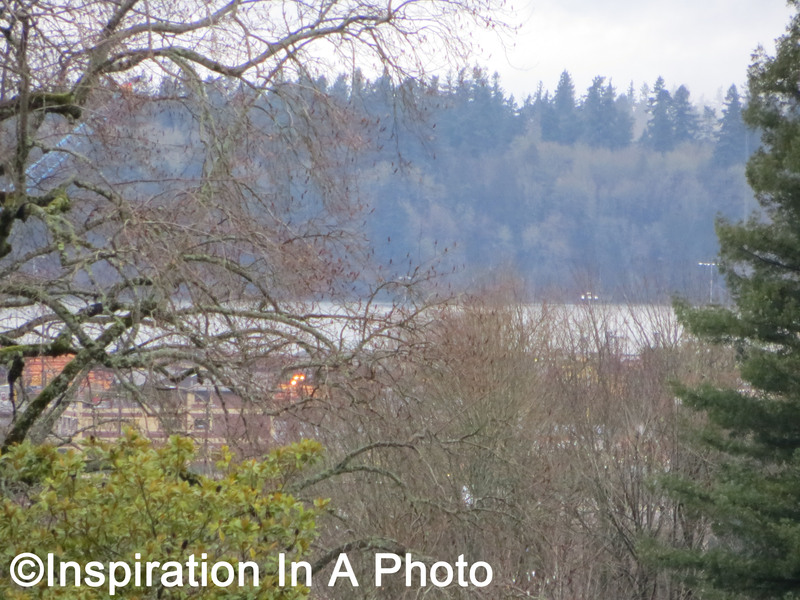 On a recent walk I happened to look over towards the bay and noticed the snow-capped mountains in the distance. I love the layers of colors in this photo: the blue of the water, green trees, and white mountains. You can bring a similar color trio into your space as well! Try adding blue, green, and white throw pillows to a couch or bed to update the look. The pillows can be plain, or you can go bold with a large geometric pattern. We often want to start fresh for the new year, but a complete overhaul of your decor can be costly. By using a few throw pillows to update your look, you can easily, and affordably, update your space. Welcome to my first video of 2016! It was taken on the same day I took the picture featured in my previous post. I hope you enjoy my video, and find inspiration from the snowy weather! Welcome to my first post of 2016! Hope you all had a Merry Christmas, and are ready for a new year. We recently got our first snow, which gave me a great inspiration for today’s post. As seen on the right, I was able to snap a picture of our snow-covered Butterfly Bush. The snow on the end of the branches makes it appear that the bush is sprouting white flowers. Photos featuring winter scenery are a great way to bring a cool color palette into your home. Add accessories in silver or gray, and you’ve instantly updated your space! Stay tuned to for more great posts and videos in 2016!